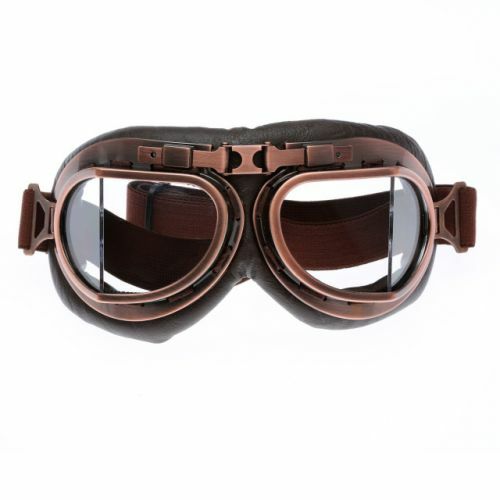 Our Best-Selling Steampunk Motorcycle Goggles At A Fraction Of It's Regular Price TODAY! You can get a pair of these latest 2017 steampunk biker goggles that is a surefire way to stand out from the crowd this Summer! These goggles usually go for $75, but on this special event we're giving 60% OFF discount for a limited time only! STYLISH ... CLASSIC ... FASHIONABLE ... these Vintage Steampunk Biker Goggles are the perfect addition to every steampunk biker's eyewear collection. The lenses of these fashionable goggles are designed using high quality resin lenses which are rated at UV400 protection to protect your eyes from the glaring sun this summer! These lenses are also made to provide super clear vision to give you the best experience from these sunglasses. The frames are also made in such a way that it is blocks out all the dust and wind which is expected when riding on your bike! The adjustable elastic straps on the goggles are made to be non-slip and keep them securely on even at high speeds. Soft foam pads used on these goggles are the latest soft foam pads design to give you more stability and comfort when wearing these goggles for long hours! This is the perfect gift for Steampunk Bikers this summer. This beautiful and stylishly custom goggles will make a great addition to any biker's collection. Buy one for yourself or as a great gift for family and friends to showcase your Love For Steampunk! The wearer of these sunglasses will stand out from the crowd. Made from high quality materials stay durable and long lasting! We ship worldwide. Tracking numbers will be generated and provided upon request. We include insured shipping included.